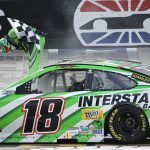 Kyle Busch brushed off his signature bow to the fans Sunday afternoon for the first time this season at Texas Motor Speedway, outlasting Kevin Harvick en route to victory in the 22nd annual O’Reilly Auto Parts 500. Busch scored his first win of the Monster Energy NASCAR Cup Series season, and first for Joe Gibbs Racing, by a margin of 0.300-seconds over Harvick. Busch, who started eighth in his No. 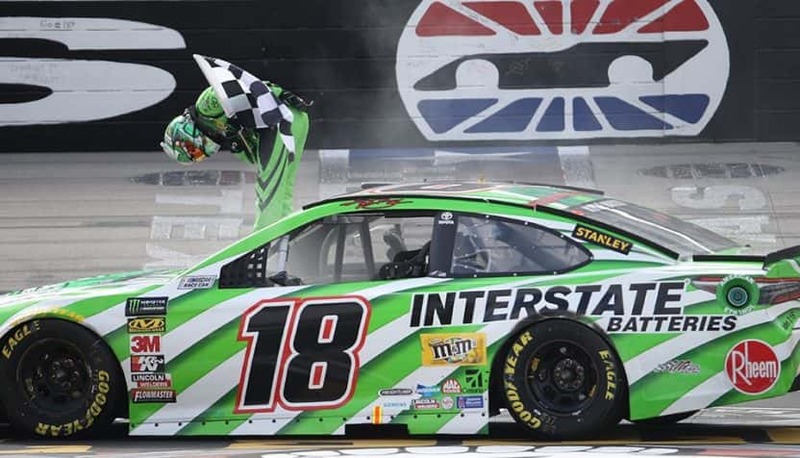 18 Interstate Batteries Toyota Camry, posted his third Cup win in 25 starts on TMS’ 1.5-mile oval. But Harvick – winner of three of the first six races this season – made it interesting over the last 20 laps. The Stewart-Haas Racing ace closed to within 0.316-seconds on Lap 329, but that was it. Busch, who also won Stage 2, scored his 44th career victory in 469 series start, but first since prevailing on the half-mile at Martinsville Speedway last October. Busch, 32, now is third on the TMS Cup wins all-time list behind seven-time series champion Jimmie Johnson (7) of Hendrick Motorsports and Carl Edwards (4), his former JGR teammate who retired after the 2016 season. “It feels awesome,” said Busch, who led a race-high four times for 116 of the 334 laps. “Any time you can win at a track that kind of isn’t maybe one of your favorites or isn’t one of your best, then it definitely means even more because it just … you try to focus on those tracks and make it a little bit more meaningful and a little bit more special to get it done. Busch exited Texas with a 38-point advantage over Team Penske’s Joey Logano, who finished sixth in his No. 22 Shell Pennzoil Ford. Harvick, who started second alongside pole-sitter Kurt Busch of SHR, led three times for 87 laps. But he battled through a series of pit road foibles – from a flying lug nut that momentarily disabled a jack to a malfunctioning air gun to an outside half of the box tire violation/team member not in contact with the outside tires penalty served by NASCAR’s pit police. In addition, Harvick faced the reality of trying to catch and pass Busch on a track that chewed up a handful of right front Goodyear tires. Reigning series champion Martin Truex Jr., Kyle Larson and Ryan Newman all experienced hard wall-bangers at speed when their right front Goodyear tires blew. The top-five was rounded out by Jamie McMurray of Chip Ganassi Racing, Erik Jones of JGR and Ryan Blaney of Team Penske. 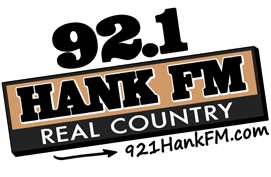 Blaney is third in the standings, 51 points behind the leader. McMurray, who started 24th in the No. 1 Cessna Chevrolet Camaro ZL1, rallied for his 11th top-10 finish in 29 races in Fort Worth. “We just had a really good car and were able to miss some of those accidents,” said McMurray, referring to eight cautions periods that included an 11-minute, 04-second red flag stoppage for a seven-car crash on Lap 178. “Our car, fortunately, was pretty good on older tires,” McMurray said. “We didn’t have as much fall-off, but still it’s hard to pass. Part of the reason it took me so long to get up there as well is I got stuck on the outside on the restarts. Maybe you would get up to 10th or 12th and then have a restart on the outside and lose four or five spots. You might spend the next 60 laps trying to get those positions back. The outside got better as the race went on, but it was really bad at the beginning of the race. “The off-weekend (for Easter) couldn’t have come at a better time for us. We had such a horrible season going and it’s awesome to run as good as we did today at a 1.5-mile. We have so many of these and I feel like we’ve been a little bit behind on the 1.5-miles, but had a really good run today.” Jones, who led twice for 64 laps, drove into contention and that fourth-place finish after starting 21st. Busch also gave a shout-out to primary sponsor Interstate Batteries, whose corporate headquarters are located in nearby Irving. Chairman Norm Miller is a longtime supporter of Texas Motor Speedway and the team owned by NFL Hall of Fame Coach Gibbs. The next major event weekend is right around the corner for Texas Motor Speedway, which will host the Verizon IndyCar Series DXC Technology 600, the NASCAR Camping World Truck Series Rattlesnake 400 and the Outdoor Powersports Off-Road Ruckus June 7-9. For tickets and more information, visit www.texasmotorspeedway.com.